Tonight I finished up the the clownfish. I made it really hard on myself by not doing a better sort. 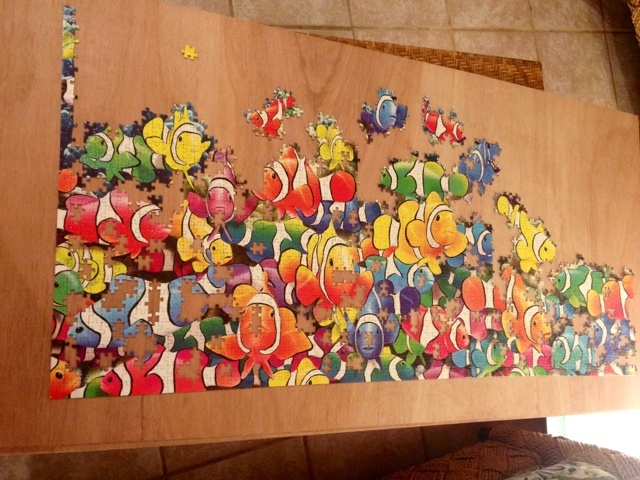 As you can see by the image, almost every fish is missing pieces which made it 10 times harder to do. In general, spend extra time sorting! It is probably the number one thing you can do to make a puzzles more enjoyable! Yay! It looks great. Yes, I didn't do a great job of sorting the first section myself, and had to go back and resort a bunch later. My buckets were way too broad that I put the pieces into. However, it was really my first attempt at a puzzle over 2,000 pieces so I just didn't understand at that point the true necessity for good sorting. I sorted section 2 into a ton of different buckets and have had a much easier time finding what I need. At least you have the hardest part out of the way now and can focus on the rest which will seem like a piece of cake.